Our life hasn’t always been perfect, but to me as long as I get to wake up to Angel in my arms every morning and get to tuck our girls into bed at the end of each day I’ll be the happiest man in the world. Nothing can come between us, nothing can tear us apart. Only…I have one regret. One that is still a black void in my head. Every year it’s the same. The self-loathing for the man I was back then. The anger that I’d taken something from the woman who has given herself to me so freely and being unable to remember a single second of it. This year it’s worse for me. It’s slowly driving me crazy. Maybe it’s time to hit rewind and give us both a do over for that night. Maybe what I really need is a memory to replace that empty blackness that is trying to swallow me whole. Bonus The Rocker…Series companion in the back. This is a novella featuring Drake and Lana from the Rocker Series. Every year that passes as Drake and Lana build their beautiful family one thing has haunted Drake. He can't remember their first time together. 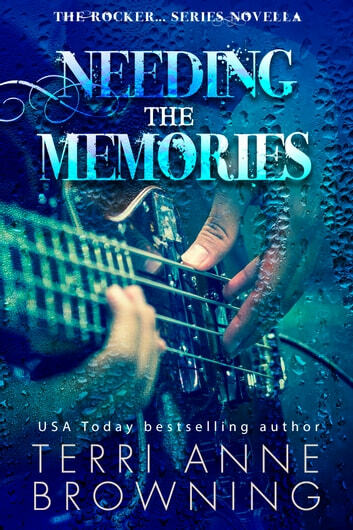 In an effort to create a new memory with Lana his angel he recreates their first time together and it is the most beautiful romantic thing I have ever had the pleasure of reading. As the story leads up to the big day we get to spend Thanksgiving with our favorite rockers from the series. I always loved the family atmosphere of this group and Terri Anne continues that says way in this novella as well. Drake was always my favorite rocker in the Rocker Series and I was so excited to get more of the Demon and his Angel. I loved this from beginning to end and for Drake and Lana the end is only the beginning. I am a Rocker Series fan and a Terri Anne Browning fan so I highly recommend her entire series. I am looking forward to more books from Ms. Browning. I hear she plans to write some stories about the Rockers' kids I anxiously anticipate those tales. Another great one for me. This is one series that I have missed and was glad to go back to an catch up with everyone, it's like a family reunion you don't see each other that often but when you do its like no time has passed at all. Which unfortunately isn't true because we now see that Drake and Lana have 4 beautiful little girls but every year between Thanksgiving and Christmas Drake fights his demons because of memories he can't recall and its hurting him something fierce. So this year he decides to do something about it, a way to make new memories so he's not feeling so consumed. He was a man on a mission who will not be denied. These two with their passion, their intensity, and the love that they have for each other is exquisite and a amazing thing to witness. Terri created a series that we all would love to live in. I for one will take this journey whenever I can as long as she keep giving it to us. Worth to buy. This is a very good story by a good author. I love the couple Drake and Lana. All the books by the author Terri is worth to buy and read.